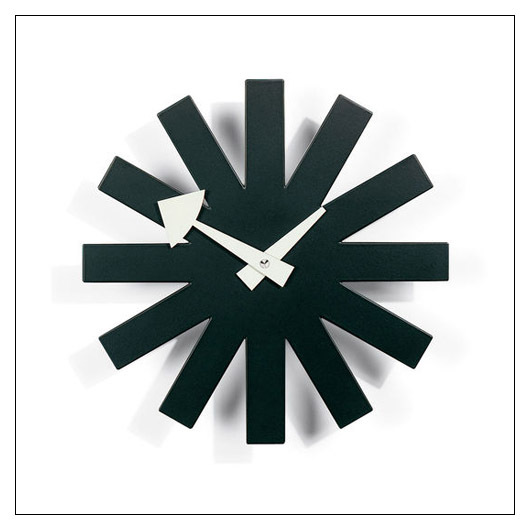 Vitra George Nelson Black Asterisk Clock (VITASTER) at Pure Design / Accessories / Clocks ::: Furniture for the Home, Office, Home Office, and More at Pure Design Online! The Asterisk clock was designed by George Nelson in the 1950's and is an icon of modern design. Manufactured by Vitra in Europe, this clock is battery powered by 1 AA battery (included) and has a quartz driven mechanism. George Nelson Clocks are perfect for any interior space in the home or office. The modern designs have an attractive sculptural shape and are a refreshing alternative to traditional timekeepers.